The Sega Master System II, a redesigned (and partially stripped-down) version of the SMS, doesn't have RGB or even composite output (although French SMS IIs have unamplified RGB output). but instead only outputs RF, also known as OH GOD MEIN EYES. There is, however, a video encoder chip inside the system which can be soldered to for just about anything you'd like. Two encoders were used in the SMS II, with older consoles using the CXA1145 and later ones using the MB3514. These chips are largely identical in function. As for connecting the whole thing, there's plenty of space at the back right of the case. I could quite comfortably fit a SCART jack in there. Knock yourself out. On NTSC SMS IIs, desoldering the RF modulator reveals unused solder pads for an 8-pin DIN jack, although you will also need to modify the case to accommodate the DIN jack. Alternately you could also solder a 9-pin mini-DIN jack upside down where the RF modulator was (aligning it with the RF jack hole), and wire it up so that you can use cables meant for the Genesis/Mega Drive 2. Variant A is actually the same chip as in the original SMS, model 1 Genesis/Mega Drive, and the Neo Geo AES. The CXA1145 is located a bit to the left and back from the cartridge slot (assuming the controller ports as front). As you can see, there's just about anything you could ever want in here - Y/C for S-video, RGB, composite, and audio. The XO pins are connected to an internal oscillator, running at 3.58 MHz or 4.43 MHz, depending on the console's region (the former for NTSC, the latter for PAL). XO Out will output that signal, XO In will allow to feed a different one in. Pin 7, NTSC/PAL In, switches the encoder between NTSC and PAL modes - connect it to Vcc for NTSC or to ground for PAL. This is the other video encoder used in the SMS II, mainly used in later consoles which had Sonic the Hedgehog built-in. It is a small 24-pin surface-mount chip located behind the RF modulator. There is no image or table for this one, because it's fundamentally the exact same chip as the CXA1145P. The only differences are its slightly lower voltage tolerance (7V instead of 10V) and two less connected pins - 11 and 13 are NC on this one. There is no composite sync output, but you can use composite video for sync instead. Vcc is 5V here as well. 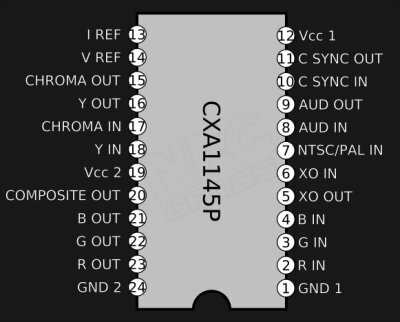 Pin 7 for PAL/NTSC switching works the same as in the CXA1145P - high signal NTSC, low signal PAL. Modding this chip for S-video is different than on the CXA1145; all that is needed for S-video on the MB3514 are a 220 uF capacitor and 75 ohm resistor for both the chroma and luma pins.